Location: Inside cytoplasmic capsid, before budding. 1. The encapsidated pre-genomic RNA (pgRNA) is the template for viral replication. The reverse transcriptase (RT) first binds to the epsilon RNA loop to initiate DNA synthesis. 2. The initiation is not made with any primer, the DNA chain is initiated at a RT Tyrosine residue, and the DNA chain is afterward covalently linked to the RT protein. 3. RT creates a minus-strand cDNA copy of the pgRNA. 4. RNAseH activity of the RT protein degrades pgRNA hybridized to DNA, except the very DR-cap primer. 5. The DR-cap primer translocates to the upstream DR motif. 7. The new DNA strand translocates to the DR1 sequence. 8. 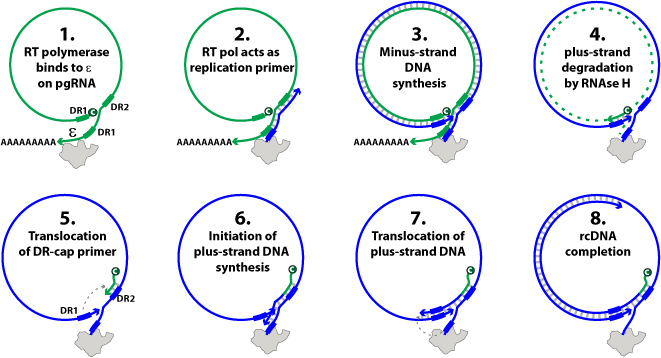 Plus-strand DNA is elongated to form the relaxed-circular DNA (rcDNA). The DNA synthesis is not complete, possibly because of exhaustion of dNTP pool inside the virion. After infection, the rcDNA is transported in the nucleus where it is converted to closed-circular cDNA (cccDNA) by host DNA repair machinary. Transcription events: cccDNA is rtanscribed by host RNA polymerase II.